Two sustainability short courses will take place starting at the end of August and ending at the end of September. What makes these courses extraordinary is the fact that they are being held in Finland at the Arctic Circle where the impacts of climate change are already pronounced. 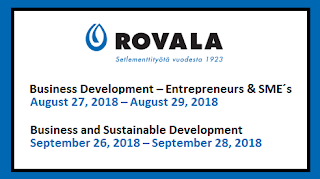 Rovala Community College (Rovala Opisto) in cooperation with Arctic Values is offering two relevant courses related to sustainability issues of corporate actors in the North. The venue of the 3-day-courses is in Rovaniemi, the capital of Finnish Lapland. In Finnish Lapland the impacts of climate change can be perceived in every-day life. In autumn it rains rather than snows and numerous species are on the decline as they struggle to adapt to a rapidly warming climate. Corporate actions to enforce sustainable development are crucial. Management and business development skills are essential assets in today’s economic reality and many of those who strive to develop a business, do not know where to start. The 3-day course “Business Development – Entrepreneurs & Small and Medium-sized Enterprises (SME´s)” provides approaches how to start a business and what needs to be done in business planning and business financing to prevail in the long-run. In the framework of the course we learn how to analyze opportunities and risks of a business concept. We open up the topical framework of business planning and business administration and link case studies to relevant themes, such as, marketing, project management and sustainable development. The participants will widen their skill-set to establish a business and will understand how to create competitive edge and survival on the markets. Individuals, who seek knowledge of economics and business management, could use this course to bridge their background with meaningful business development methods. How to integrate sustainable development into corporate activities. These courses will also use case studies from northern latitudes to give practical insights and to achieve the learning objectives. All participants will be awarded with a certificate upon completion of the course.